It is hard to find a fossil more famous than ‘Lucy’. Regardless of how much a person knows about the evolution of fossil human ancestors, the odds are that Lucy rings a bell. The petite hominin was discovered during a routine fossil survey on November 30th, 1974 in the remote Afar region of northern Ethiopia by the paleoanthropologist Donald Johanson and student Tom Gray. The pair saw part of an arm-bone sticking out of the dusty sediments and, after recovering it, further excavations that day yielded almost half of an entire skeleton: part of the pelvis, some ribs, part of a right leg, the mandible, pieces of skull, as well as the other arm. For paleoanthropology, which builds the fossil record of human evolution scrap by scrap, the discovery of a 40 per cent complete skeleton was unprecedented. Christened after the Beatles song ‘Lucy In The Sky With Diamonds’, which was played at camp on the night of the discovery, Lucy was introduced to the rest of the world three weeks later at a press event in the Ethiopian capital, Addis Ababa, headlining the front page of the Ethiopian Herald. Johanson referred to the discovery as ‘Lucy’. From Addis Ababa, Lucy was taken to the Cleveland Museum of Natural History in the US for intensive study. In 1976 she was assigned to the new species of fossil hominin called Australopithecus afarensis, a name with a nod to the Afar region where she was found. In the ensuing decades, she has continued to be a driving force of research in paleoanthropology, with every new study about Lucy gaining scientific traction, while giving the public more minutiae about her life. Geologists put her age at 3.2 million years old. Paleoanthropologists analysed how she walked (bipedally – upright, on two legs) and what she ate (a plant-based diet). In August this year, scientists from the University of Texas claimed to have assessed how Lucy died – by falling out of a tree – thanks to extensive CT scans. First and foremost, Lucy functions as a symbol and ambassador for Ethiopia. Signs at Bole International Airport and billboards around the National Museum in Addis Ababa proclaim ‘Welcome to Lucy’s Home: Cradle of Humankind!’ She reminds us that national symbols have a lot of staying power and Lucy offers a way of legitimising the deep history of human evolution along with Ethiopia’s own past. To that end, she continues to resonate strongly within the country through a plethora of nicknames, each of which offer a more nuanced cultural provenance than just ‘Lucy’. In Amharic she is Dinkinesh (‘You are marvellous’). In Afar she is Heelomali (‘She is special’). Each time the fossil is named, another layer of meaning is mapped onto her and she becomes ever more connected to her audiences. In the world of popular science writing, Johanson published five best-selling books between 1981 and 2009, all with Lucy in their title. Hers is a great, swashbuckling story of discovery with a media-savvy discoverer to leverage her celebrity into research funding and cultural acclaim. On a less exalted level, the Unemployed Philosopher’s Guild puts Lucy on one of their hipster T-shirts; the Lucille Ball-inspired ‘I Love Lucy’ logo silk-screened over a print of the fossil’s skeleton. This cultural connection between fossil and audience occurs when a fossil is no longer an ‘it’ – an object that is merely a museum catalogue number, a thing on display. When a fossil has become a ‘her’ – an anthropomorphised ancestor complete with a paleo-persona – the fossil can connect with audiences on any number of levels. AL 288-1 – Lucy’s catalogue number – has bridged that transition. She has become the public face of paleoanthropology. All new fossil discoveries mentioned in the media are compared with Lucy in some way, shape, or form: older than Lucy, younger than Lucy, larger than Lucy, walked like Lucy. She is the standard by which others are measured. It is as if the public uses Lucy to triangulate its own navigation of the hominin family tree and to assess its own species’ evolution and what it thinks about that. 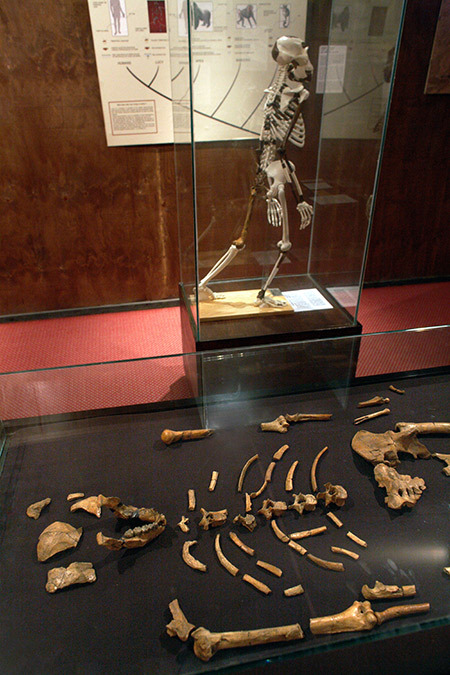 Thanks to the luck and context of her discovery, Lucy was, like any celebrity, in the right place at the right time, able to offer fossil evidence to answer evolutionary questions that the public are interested in (such as locomotion, diet, phylogeny) that were once thought of interest only to those who studied and practised paleoanthropology. Consequently, then, to talk about Lucy is to talk about her evolutionary significance, but it is to also to invoke everything that is cultural about her, from the Beatles legacy onward. It is instructive to remember that she was Lucy before she became Australopithecus afarensis. Lydia Pyne is a historian and writer and the author of Seven Skeletons: the Evolution of the World's Most Famous Fossils.